Google is an inescapable digital entity sewed into nearly every aspect of your life. Whether you want to look up something on the internet, drive to a new destination, or watch that video everyone’s been talking about. While there’s not much you can still do to eliminate Google entirely from your life, there are ways you can limit its reach and reclaim control over your personal data. Here are all the ways Google can track you and how you can delete or stop it. One of the Google services which is impossible to quit is Maps since there are no decent alternatives. Whenever you use Google Maps to search or navigate somewhere, Google stores coordinates of exactly where you have been. The company employs this information, apart from improving its service, to power features like commute suggestions before you leave your house, send a notification card if you’re, for instance, at a restaurant, and more. Modify how much data is being collected by tweaking three settings. 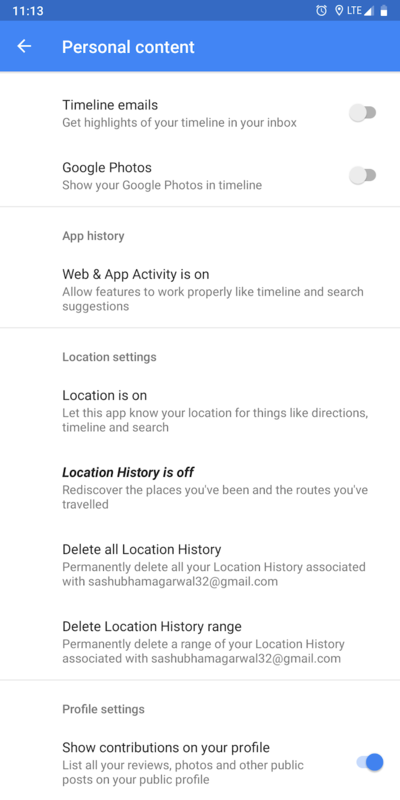 Location History prevents Google from saving details of all the places you’ve visited and the routes you’ve traveled. Disabling it won’t really affect your experience but you will lose the ability to view the trips you’ve taken on Google Maps if you need to later. The Location option is simply a link to your phone’s GPS setting. Turning it off will restrict Google Maps from accessing your whereabouts. You can even revoke the GPS permission specifically for Google Maps, ensuring it doesn’t spy on you in the background. The Web and App Activity switch, however, is the most critical one here. Enabling it lets Google save all of your activities on any Google product or service. This also allows Google to share your location data between its own apps to offer a more personal experience. To cut back on the data you feed Google, disable this setting. These options are located in one place. You need to open the Google Maps app, swipe from the left edge to pull the navigation drawer, and tap Settings. Now, hit Personal Content and you will find those tweaks under App History and Location Settings. Pro tip: To grant Android permissions on a temporary basis, try Bouncer. It can automatically revoke permissions as soon as you leave a particular app. In the same page, you will also have all the links you will need to delete existing location data. 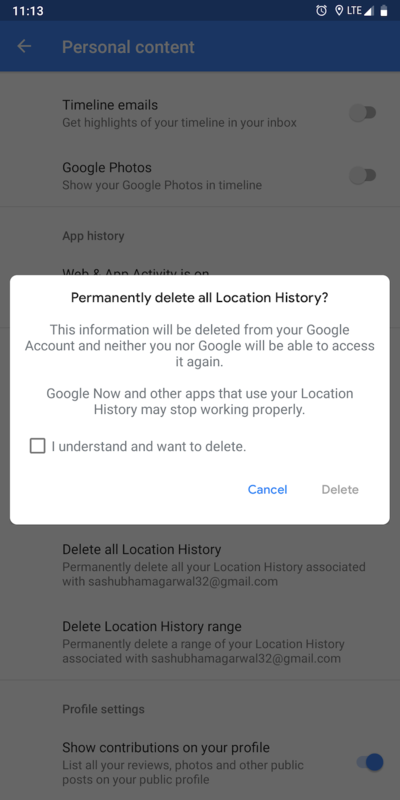 Look for Delete all Location History and Delete Location History Range. On the previous screen there’s even a Maps History option to discard specific entries from your location history. If you’re on Android, Google doesn’t even need Maps to track you. Irrespective of whether the location setting is on, your Android phone constantly records your movements. The only way out of this is to disable both Web & App Activity and Location History. Don’t have the Maps app installed but want to access those privacy settings? Visit your My Activity dashboard and on the left menu, find Activity Controls to access those settings. Again, to delete any specific location information, you can do so from the dashboard’s home page. On Android phones, Google also stores a bunch of your other personal data such as contacts, calendar appointments, and even app usage. It knows when you’ve fired up a particular app, how many times, and for how long to stitch behavioral patterns and bring appropriate updates for the operating system. To prevent from this happening, use the Device Information setting on the Activity Controls page. For deleting a specific entry, you will have to return to the My Activity dashboard’s home page. What you search on Google, of course, significantly contributes to algorithms that are designed to figure you out and your preferences. But you can take control of your search queries as well from the My Activity website. You can either pause the feature that records your search history or remove any existing ones from the database. For the former, you will have to switch off Web & App Activity and the latter can be done from the home page. In addition, Google knows what you have been watching on the internet through your YouTube account’s search and viewing history. But you can put an end to that. The options for tweaking both of those are situated at the bottom of the Activity Controls page. To delete head into the Delete Activity By tab for removing the watch history from a period. Alternatively, you can head into Settings > History & Privacy on the YouTube app. Google’s homegrown browser Chrome plays a critical role here. It tells the company what you’ve been browsing on the entire internet, not just on a specific service. Apart from recording your history, Google Chrome also has a few other ways it shares your data, sending system information, page content, and more. To exclude Chrome history and your activity on various sites, visit the Activity Controls page and under Web & App Activity, disable the Include Chrome history option. In addition, you should uncheck the Help improve safe browsing and automatically send usage statistics available inside Chrome settings. For removing a specific entry from your Chrome logs, visit the My Activity dashboard. The best method to escape Google’s data-hungry practices, of course, is to switch to another browser. There are a host of Chrome alternatives available in the market which are equally if not more capable. If you want to continue using Google Chrome, you can also try switching off Sync by signing out. All your questions and conversations with the Google Assistant are also stored permanently. Google says it does so to ensure the virtual assistant listens when called and improve its speech recognition algorithms in general. If you’re not comfortable with this, however, you can shut it off. Note that disabling the voice activity setting will compromise a few Google Assistant features such as multiple profiles on Google Home. The Voice and Audio Activity is located in the Activity Controls tab. To get rid of a specific recording and command, though, you will have to search the My Activity page. Your synced pictures on Google Photos are processed for object and facial recognition. Unfortunately, there’s nothing you can about it except leave the platform. The majority of Google Photos’ highlighting features require that your photos are scanned by algorithms for purposes like grouping them by faces, objects, and more. Even after going through all those privacy settings and history, there’s still a chance Google will find some way to track you. To make sure you haven’t missed anything, download all the data Google has on you since the first time you began using its services.